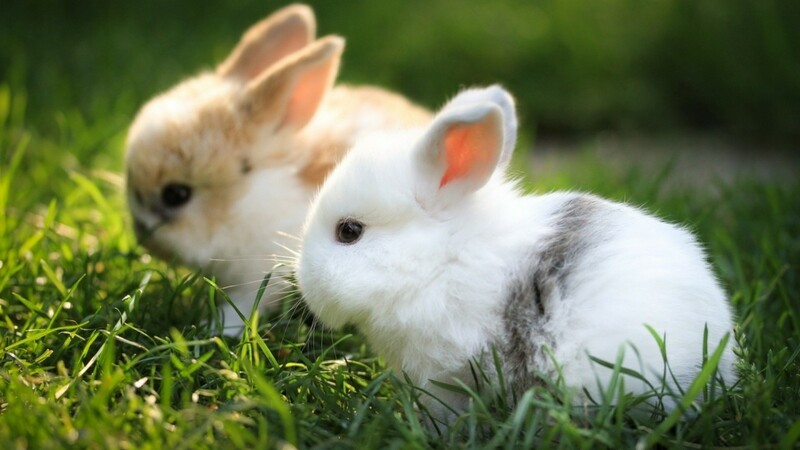 Here you will find information about baby animals and pictures of them. 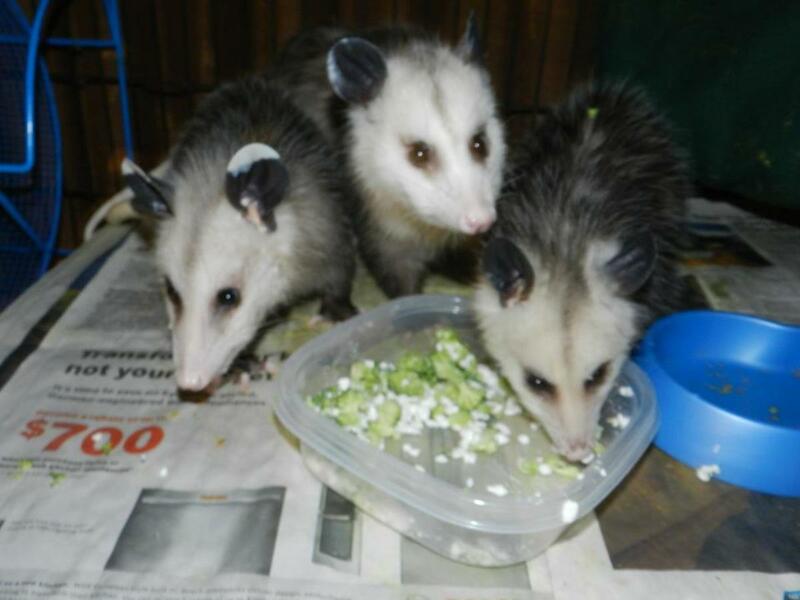 Living in the woods, as I do, gives me a special appreciation for nature, animals, and especially baby animals. I love to see the little ones with their mamma. 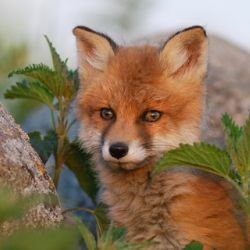 This page includes pictures of baby foxes, baby bobcats, baby raccoons, baby giraffes, baby monkeys, baby hummingbirds, baby woodpeckers, baby owls, baby polar bears, and baby moose. 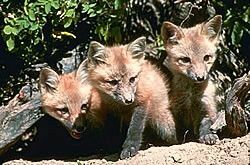 The female red fox gives birth to 4 to 10 babies (averaging about five) in late March or early April. At birth, the pups weigh about 3.5 ounces. Their eyes open in about 10 days and they emerge from the den when they're about 5 weeks old. By the time they're eight weeks old, the pups have been weaned. By September, the young males will have dispersed to find their own territories. 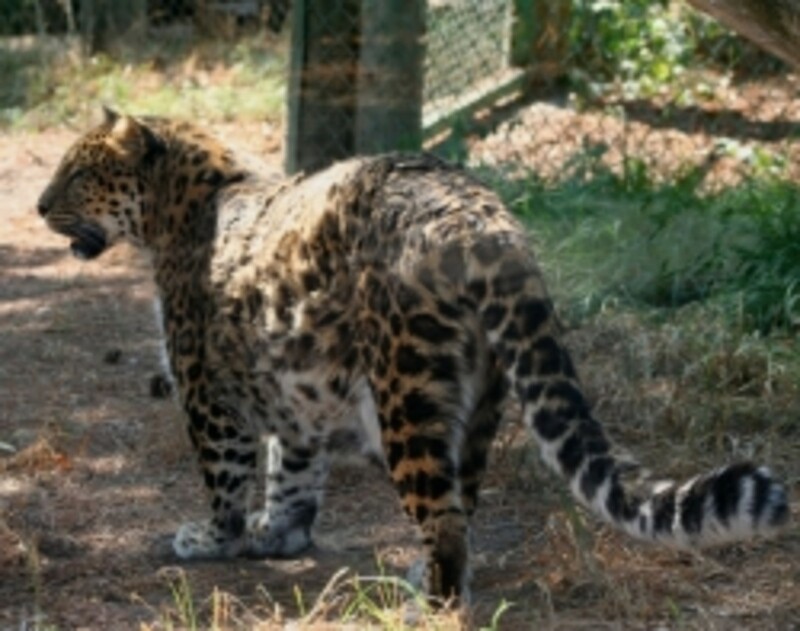 Depending upon the availability of food on the home territory, the young females may either disperse a little later than the males, or stay on the territory for up to several years. Sweet photo of two red fox pups. A must see! A nice collection of images of red fox pups. Two very nice pictures of baby red foxes. 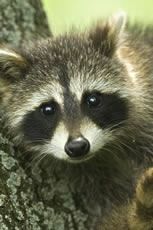 Baby raccoons are usually born in April or May in the northern areas and throughout the year in the southern U.S. The size of the litter is from three to seven babies, weighing about 2 to 2.5 ounces each. Baby raccoons don't open their eyes until they are about three weeks old and they aren't able to stand on their own for 4 to 6 weeks. In the northern U.S., the family usually stays together through the winter, with the young dispersing the following spring when the female has her next litter. 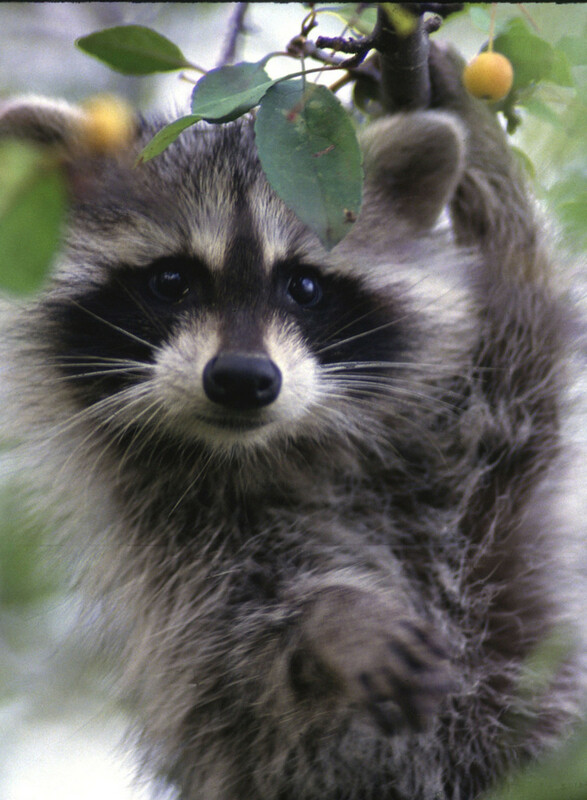 Very cute picture of a baby raccoon. 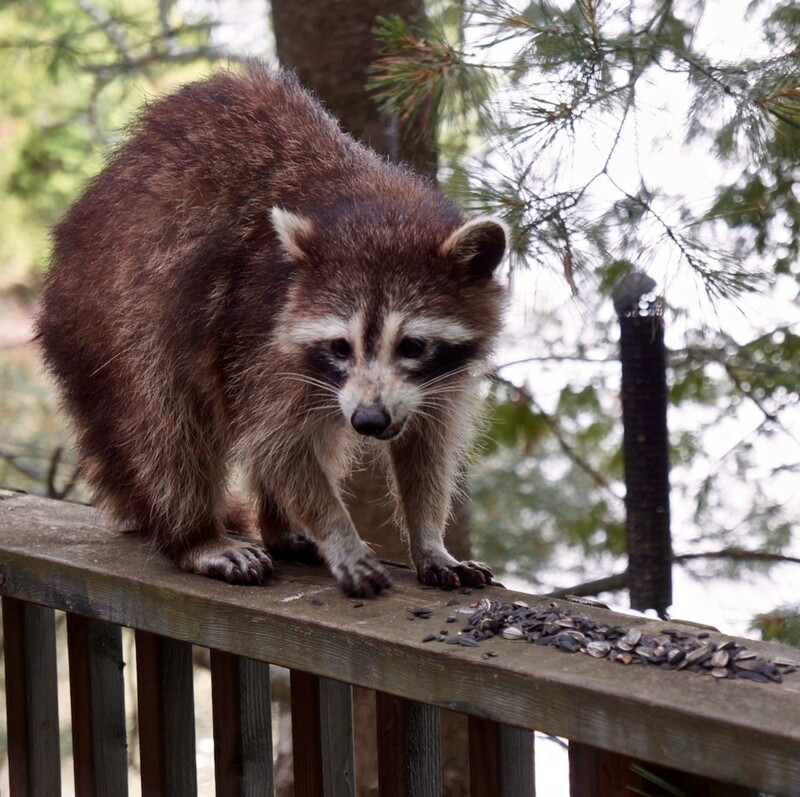 Photos of baby raccoons raiding cherry tree. The video is a little shaky in places, but I found it very interesting to watch. Have you ever seen a baby raccoon? 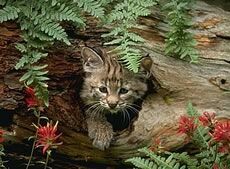 This is a photo of a cute baby bobcat coming out of a hollow log. In spring or early summer, the female bobcat gives birth to 2 - 4 kits, although the litter can be as small as one or as large as six. The young open their eyes when they're nine or ten days old. They'll nurse for about 2 months and be hunting on their own by the fall. The kits stay with their mother for up to a year and then disperse before she has her next litter. Mamma bobcat grooming her baby. Bobcat kitten in the wild - from National Geographic. Two young bobcats in a tree. Baby bobcat exploring the world. A female giraffe doesn't generally breed before her fifth year. 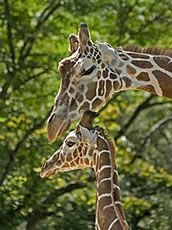 She carries her single baby for 15 months before giving birth while standing, with the young giraffe falling as much as six feet to the ground. The newborn calf is about 6 feet tall and weighs 80-150 pounds. Within about 20 minutes of birth the young giraffe is able to stand up and it starts nursing within an hour. A baby giraffe is weaned at 12-15 months of age and becomes fully independent approximately 3-4 months later. 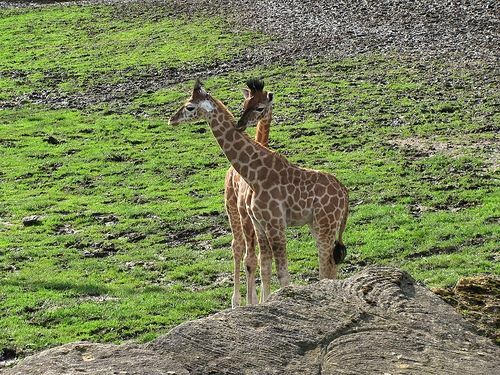 Shows photos of baby giraffes in the wild and provides information about giraffe reproduction. Photos and video of a baby giraffe being born and right after birth. Lots of photos of giraffe calves, some taken with their mothers. All are taken in a zoo setting. There are many different species of monkeys, from the Vervet Monkey to the Ginger Monkey. 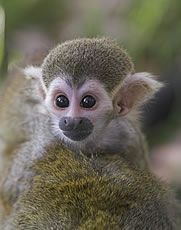 The female of most monkey species have 1 or 2 babies per litter. Monkey infants are helpless at birth, so they often ride on their mother's back until they get older. The size and weight of the newborn and the time to maturity varies greatly between species. Provides pictures of a baby Chacma Baboon with its mother and a baby Vervet Monkey with its mother. Also includes brief details about the behavior of the young of each species. Very nice photo of a female monkey with her baby. This is an excellent photo of a red-backed squirrel monkey and its two young ones. This is a photo of a female ruby-throated hummingbird at the nest. In case you wondered, it's the male of the species that has the red throat. The nest of the ruby-throated hummingbird is about 1-1.75 inches in diameter. In the spring, the female lays 2 pea-sized eggs. After they hatch, she feeds the nestlings for about three weeks. Occasionally, she then starts a second brood. 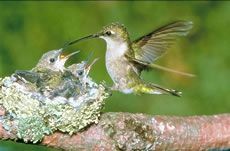 Shows photos of female hummingbird on nest, the eggs, and then the tiny babies as they hatch, grow, and leave the nest. Note: Click the "Next Page" link at bottom of each page to see the progression. Sequence shows the female feeding the young ones and the process of their growth. Have you ever seen a baby hummingbird? The bird in the photo below is a pileated woodpecker at the nest with two hungry babies. The pileated woodpecker excavates a new nest cavity each year - usually in a dead tree, but occasionally in a live tree. The female pileated woodpecker lays 3-5 eggs which hatch in about 16 days. Both the male and female bird incubate the eggs. The nestlings are fed by both parents and leave the nest at about 4 weeks of age. Amazingly, their first flight from the nest can be up to a hundred yards. The young birds remain with their parents for several months after fledging. Nice photos of pileated woodpeckers at the nesting hole with their babies. Photo of the young ones sticking their heads out of nesting hole. Very interesting series of photos of parents feeding young at the nest. This fluffy baby is a Great Horned Owl chick. Great Horned Owls often take over the abandoned nests of other birds. But they may also nest in tree cavities, old squirrel nests, cave entrances, or cliff ledges - depending upon the habitat. The female usually lays 2-3 eggs which hatch in 26 to 35 days. Occasionally, there will be as many as 5 eggs. Both parents incubate the eggs and feed the young when they hatch. The young owlets initially climb out onto a tree branch about 5 or 6 weeks after hatching. It takes another several weeks before they learn to fly. Nice selection of photos of baby Barred Owls at different stages of growth. Cute pictures and video of young screech owlet. 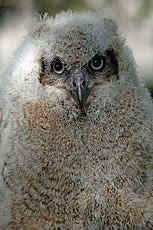 Large collection of photos of baby owls from The Owl Pages. Some very cute pictures of baby owls. In the fall, the female polar bear digs a den in a deep snowdrift or, occasionally, in the frozen ground. 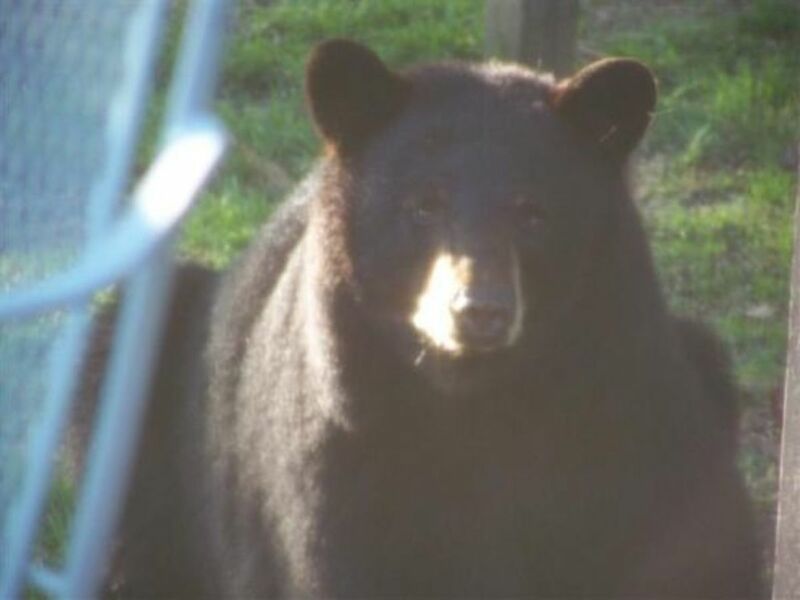 During the early winter, the female bears her young. The litter commonly consists of two cubs. The mother nurses her cubs until she and the young ones leave the den in March or April. They remain near the den for a short period to allow the cubs to adjust to the colder temperatures. Then the family leaves the vicinity of the den and moves to an area where the female can hunt seals. The female continues to nurse the cubs until sometime between their first and second birthday. Credit: NOAA Climate Program Office, NABOS 2006 Expedition. Beautiful photo of mamma polar bear with her two very young cubs. Very nice photo of female polar bear with one of her cubs. Image of mother polar bear with her two cubs. Very cute photo of a young moose calf with its mother. Newborn baby moose with female. Young moose calf walking with its mother. Have you ever seen a baby moose? Pictures of baby mammals, birds, and other creatures from Animal Planet. Very nice selection of photos of baby animals from The Denver Post. 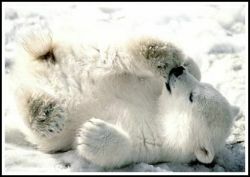 Beautiful photos of baby animals, including the harp seal, elephant, lynx, black bear, bobcat, and polar bear. Cute pictures of baby animals from ABC News. Offers beautiful photos of wild baby animals with their mothers. Includes information about the animals' communication, diet, grooming, and more - in simple language. For children age 5 and up. This book contains outstanding photos of baby animals, along with the name for each baby and some basic facts in simple language. For children in preschool through grade three. The author has written over 200 science books for children. Credit :NOAA Climate Program Office, NABOS 2006 Expedition. These photos are being used under a royalty free license or a Creative Commons license or are public domain photos (credited to the appropriate agency). The original copyright belongs to the photographers and/or agencies listed above. Please share your thoughts on baby animals or this article. Very cute lens! Many awww's and oooo's for the baby animals from my wife and daughter. I love this lens as well! Baby animals are so cute! i love racoons n polar bear cubs, they're so cute! great pictures - love them! Thanks for sharing rare pictures of baby animals - so cute.. Awesome pictures. A lot of education information, too. I love the cow moose and calf. Wouldn't want to get too close to that pair though, the mamas can be pretty aggressive! Thanks for sharing the beautiful photos. Baby animals are so cute. I saw some baby horses in a field a few days ago bucking around and prancing. They were so adorable. I like this lens! Baby animals are so cute. Such cute pictures. Thanks for sharing. What an irresistible peak at nature! Blessings. I love them all. Great collection all in one place. Definitely gotta hot topic with baby animals. Sooo adorable. Your photos are fabulous. Great lens. This is soooooo cute! Seeing these adorable creatures really made my day. I love the first picture in introduction module. Nice lens about baby animals. Love it. Loved the pictures. The baby animals are so cute, that I just feel like taking one of them home with me. Awesome lens! Loved them all - especially the polar bears and the foxes. i like the photos a lot. Adorable pictures and interesting facts make this a fun lens to read. Great job! They are so cute! I love them. Nice lens! Awww baby bobcats are adroable! They are so cute! No one can ever tire of watching pictures of baby animals. They put an instant smile to your face! Brilliant! 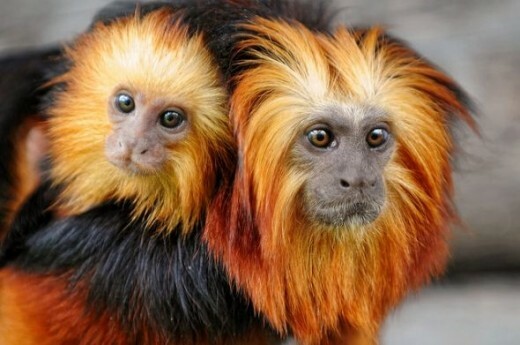 Love the Tamarin Monkeys! Awwwww! They are sooooo cute! Great and informative little lens! My little girl loved all the baby animal photographs. Another beautiful story by you and again - awesome pics !!! I love all the pictures.....a nice nature visit. Thanks for a beautiful lens. How cool are the photos. Thanks for a fantastic lens. Cute as buttons! Thanks for sharing these adorable snapshots. This lens made me smile. I love animals and live surrounded by woods, too. Beautiful pictures! Wonderful lens with outstanding pictures! Really enjoyed my visit! What a beautiful lens. There is nothing as cute as a baby ... anything. What can I say? a-d-o-r-e-a-b-l-e! Here's a blessing for you and the little ones. This is a beautiful lens! It deserves to be blessed! All babies are beautiful and thanks for the lens. why are baby animals so cute? I want to pet them al like elmira. I love, love, love all your beautiful baby animal pictures! I adore the photos of the bobcat mother and kittens - I have seen a couple of bobcats near the golf course where I live, but no babies. I did see a mommy otter and three babies crossing the road to another pond one morning and they were really cute! Visiting again to admire their cute-ness! Awesome, the baby animals pictures are very adorable. I wish I could adopt some..
Where's the wolves? I love wolves. but did love the rest of this lens too! *****:) thanks for sharing! This lens had me smiling all the way through it - thanks! Love your baby animals photos! Especially the cute baby foxes. I have been seeing a lot of foxes in our neighborhood lately - one of them was brave enough to come within 10 feet of us when we were out for a walk. Baby animals are always looks cute and adorable, it make this lens look great and cute. This lens is beautiful; nice work. all babies are cute whether animals or humans. Beautiful lens! The red fox is especially gorgeous. Just delightful, I have so enjoyed this Lens! Nothing is panacea for the soul quite like a bunch of cute animals to look at. Baby animals are so cute. Who wouldn't want to see pics of them? these are a delight. I like taking wildlife photos and hope you'll have time to come see my baby alligator lens and the baby sandhill cranes lens. Love the pic of the baby wildcat peeking out of the log. Who doesn't love baby animals? They are so cute. The fox photos remind me of my kitten who my husband says looks like a baby fox. He's right. Thanks for getting back to me so quickly. Congrats on the purple star award. Baby animals are so cute. Even that baby raccoon is adorable. Great photos. I absolutely loved your lens! Awesome photos! @anonymous: Thank you for your kind words. :) Yes, I have taken photos of some of the critters around here. The photo in the intro section of my Animal Quiz lens is one I took. And there are a couple of mine in the White-tailed deer lens I hope to publish soon. Well, I'm a red-blooded, show no emotion, American male...and I can't resist baby animals.